Although many astronomers enjoy films and books like Apollo 13 and The Right Stuff, the majority of astronomers seem to favor robotic exploration over manned spaceflight. The most common argument is that robotic exploration is simply more efficient and cost-effective than human exploration. A recent paper by Ian Crawford challenges this view by arguing that the increased mobility, flexibility, and efficiency of human exploration outweigh the added cost of sending people into space. Humans can make spur of the moment decisions and react well to sudden changes. Humans are better at selecting diverse samples and a manned mission is automatically a sample return mission. Humans are better suited to conducting complex tasks like drilling. Human spaceflight has enabled space-based astronomy. Think of all of the fantastic science that was enabled by the space shuttle servicing missions to the Hubble Space Telescope. Crawford addresses the first four bullet points by comparing the performance of the Apollo astronauts with the performance of robotic missions to the Moon and Mars. The disparity between the manned and robotic missions is striking: the Apollo astronauts collected and returned 382 kg of samples from more than 2000 different sampling locations while the Luna sample return missions returned only 0.32 kg of Moon rocks. In addition, many more referred scientific papers have been written about the Apollo data than about data from robotic missions. 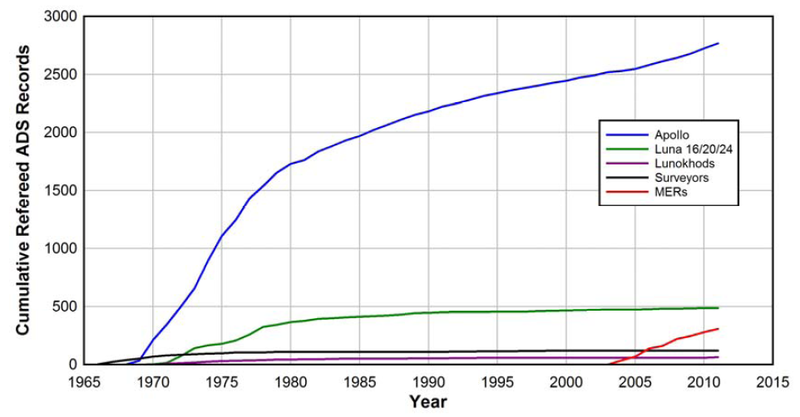 As shown in the figure below, scientists have written over 2500 refereed publications about the Apollo data, roughly 500 publications about the Luna sample return data, and fewer than 500 papers about data from the Lunokhods, Surveyors, and Mars Exploration Rovers. Interestingly, the rate of papers about Apollo is still rising despite the fact that the last Apollo astronauts left the Moon in 1972. Cumulative number of refereed publications in the ADS database about data collected during the Apollo, the Luna sample return (16, 20, and 24), Lunokhods, Surveyors, and Mars Exploration Rovers missions. Figure 2 from Crawford 2012. Although the scientific rewards of the Apollo missions are impressive, the cost of the Apollo program was significantly higher than the cost of the robotic missions to the Moon and Mars. Crawford states that the Apollo program would cost $175 billion in 2012 dollars while the most expensive of the robotic missions (the Mars Science Laboratory, currently en route to Mars) cost $2.5 billion. However, Crawford projects that the cost of robotic missions will continue to increase as planetary scientists design rovers to accomplish more complicated tasks. The figure below illustrates that point by comparing the cost of Pathfinder, the Mars Exploration Rovers, the Mars Science Laboratory, and a proposed Mars Sample Return mission. With each generation, the rovers became bigger and better able to explore the Martian surface. Unfortunately, the increase in scientific capability comes with an increasing price tag. Crawford questions whether future science budgets will have enough cash to pay for bigger and bigger rovers given the current issues funding robotic space exploration. 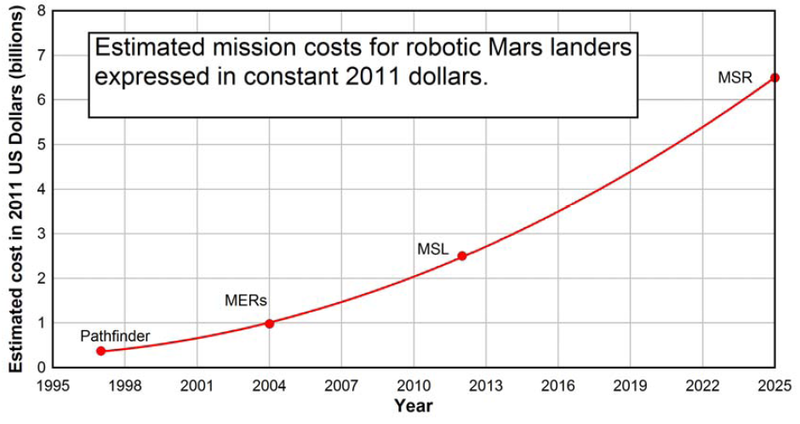 Cost in 2011 US dollars of the robotic Mars missions. The cost is increasing because newer rovers are designed to accomplish more complicated objectives. Figure 4 from Crawford 2012. In Crawford’s opinion, the solution around the increasing cost of robotic exploration is to piggyback science on politically-motivated missions that are primarily funded through non-science avenues. For instance, the bulk of the $175 billion spent on Apollo would have been spent regardless of whether there was any science associated with the race to the Moon. Crawford states that the added science cost of the Apollo program is only $2.09 billion in 2012 dollars: nearly $0.5 billion less than the Mars Science Laboratory. In order to advance scientific understanding of the Solar System, Crawford argues that astronomers should participate in human exploration of the Solar System such as the program outlined by the world’s space agencies in the Global Exploration Roadmap. What do astronomers at your institution think about human exploration of the solar system? Should astronomers actively support sending humans to the Moon and Mars? Please share your opinions in the comments section. To get the conversation started, check out this neat list of human and robotic advantages. The sections on human maintainability and response time are particularly amusing. 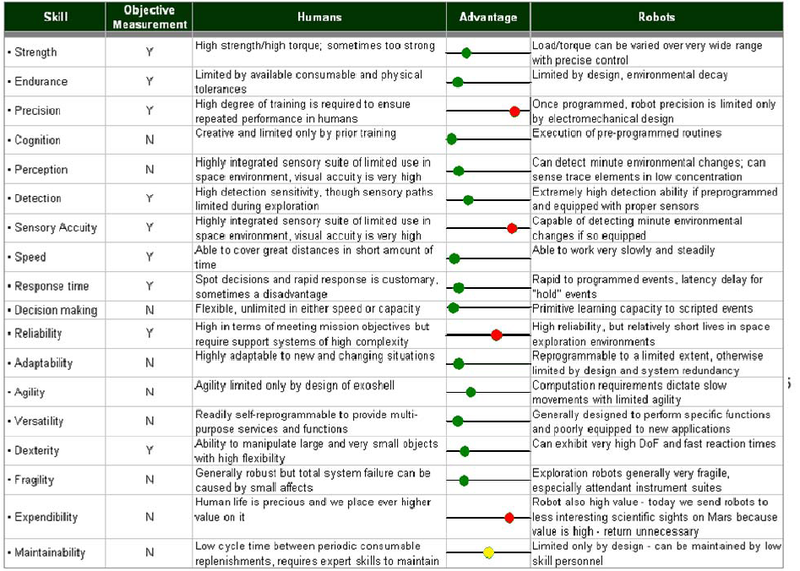 A comparison of the relative advantages of humans and robots. Green circles indicate that humans have the advantage, red circles indicate the robots have the advantage, and yellow circles indicate equal ability. Figure 1 from Crawford 2012 (originally from Garvin 2004). We studied relative productivities of a highly (more so than MSL) automated rover vs geologists in spacesuit vs terrestrial shirtsleeved geologists, at a Mars analog site (Haughton Crater, Nunavut, Canada) in 2002-04. At a first cut, we found that rovers with a *high* degree of automation were about 5-10% as productive, on a unit time basis, as a human geologist in a spacesuit. Who in turn was only about 15-20% as productive as a terrestrial geologist in shirtsleeves. So if I could choose between a 6-month rover mission (again, with more autonomy than MSL) vs a 6-month human mission, the humans win easily in terms of science output. But robots can still win by being more numerous, and/or an order of magnitude cheaper, and/or capable of much longer duration missions. *If* they are used in those ways, which they often aren’t. Thanks for covering this, Courtney! I think it’s important to point out that budgeting for space exploration is not a zero-sum game. I have heard arguments that because it is more expensive to put humans in space, we should focus exclusively on robotic exploration. However, I think the first figure in your post shows how human exploration, which brings more returns (both physically and in terms of resulting discoveries) than robots, can increase funding for space exploration in general, enabling more human and robotic missions in the future. I think it’s one thing to consider manned Mars missions and ‘piggybacking science’ on to them, and quite another to consider that science will progress best through manned missions everywhere in the solar system. There are very few ‘good’ places to send manned missions, but they aren’t necessarily the only (or most scientifically interesting) places we may want to go. Considering the cost of sending humans (bigger-heavier spaceship), life supporting equipment, return equipment, and all of these in the least possible time (muliplying the overall cost) I think it favors the robots. For 175billions of sending humans to Moon, we could have send maybe 20 – 30 robotic missions speaded accross all the surface, multiplying the scientific output. Also consider that in 1960 electronics were too primal to support complex robotic missions, I dont see how we could do it without sending humans. Today things are vastly differend. What would be the cost of sending humans to mars? 175bills (cost for moon) would be sufficient; given increased fuell cost etc I dont think so. But even if that was sufficient its almost 27 times the cost of MSR. If it wasnt a money problem, humans would be better. but, it is indeed. Add to the above that the elevated scientific output of the manned missions to moon was partly due to that astronauts themselfs being a scientific subject of research. From the space suits to Life supporting equipment, everything was researched-used for first time. Same goes for the systems used on that mission, telecomunications and others.